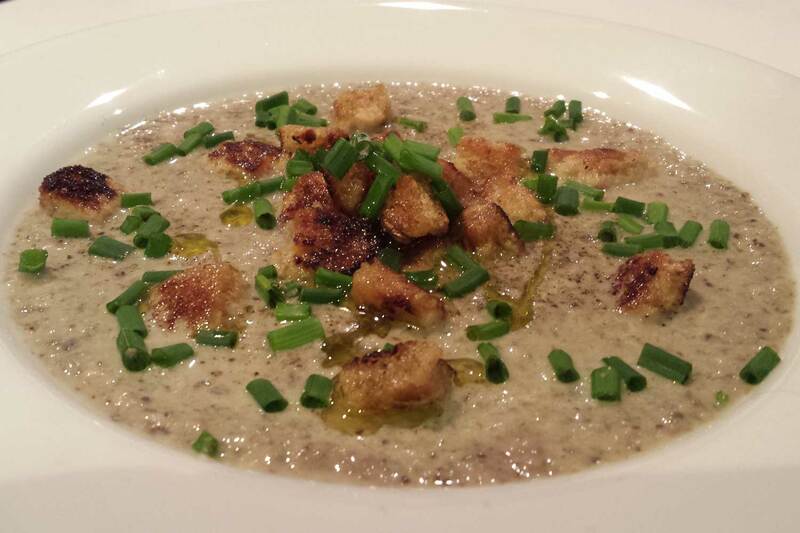 This humble mushroom soup is taken to new heights by the addition of a drizzle of Pomora white truffle oil. Gently fry off the onion, garlic and thyme with the butter for about 5 minutes. Add the chopped mushrooms and continue to fry for a further 10 minutes. Add the vegetable stock, bring to the boil and simmer for 20 minutes. Add the crème fraiche and simmer for a further 5 minutes. Liquidize the soup with either a hand blender or a food processor. Put a nob of butter in a frying pan and bring up to a medium heat. Add the cubes of bread and fry until golden brown, stirring all the time. Remove from the pan and drain on kitchen paper. To serve, make sure the soup is heated through and place a generous helping in a bowl. Sprinkle some chopped chives and croutons on top and then drizzle over some Pomora white truffle oil. Scrummy! An autumnal favourite and a real treat.